Nutrition | real food. home made. Disclaimer: This post is not intended to berate anyone, I just want to introduce you to a new way of thinking. This weekend was spent in the Fort Worth area of Texas. 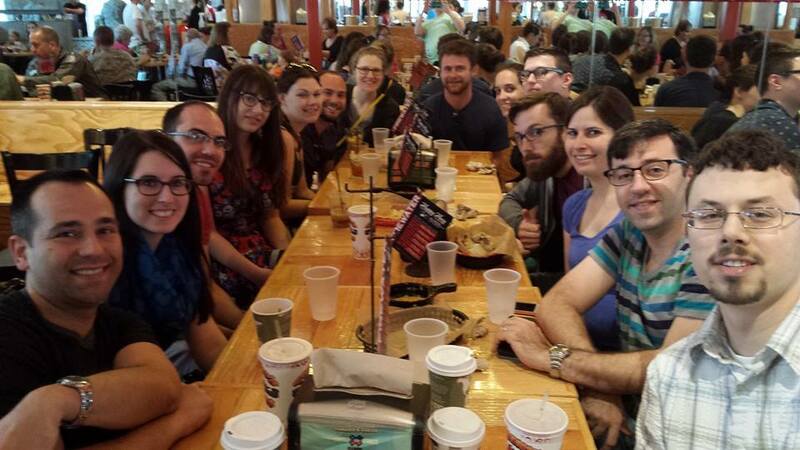 We met up with a dozen and a half friends and painted the town red. We witnessed the marriage of our friends Paul and Heather, and experienced probably everything Fort Worth has to offer (at least the best stuff!). Throughout the trip I noticed multiple people remarking how one of our friends “couldn’t drink because she is pregnant” and this type of speech irks me considerably but I was never before able to put my finger on exactly why. When you say that somebody cannot do something, it takes the personal responsibility off of their shoulders, which I think belittles them. If I were pregnant and somebody told me I “couldn’t drink” I would lash out and say (respectfully, of course) “I have the capability to drink. If I bring this glass to my lips, would not the spirits easily pass down my throat? I am choosing not to drink for the health of my baby.” Something along those lines. And I feel that our friend deserves the same respect for her commendable decision. When it comes to eating out in restaurants, how many times have you heard “I will get the salad, because I am on a diet”. Or “no dessert for me, I am on a diet.” It must be that people are ashamed to refuse dessert or eat healthy just because they want to! I have broken this habit a long time ago. It is just as easy to say “I’ll have the salad because that sounds delicious”, or “no dessert for me please” (you don’t need an excuse). Next time you find yourselves belittling your or others’ decisions with excuses, try and think of another way to word it that praises people for their healthy decisions. If we keep feeling ashamed in this way, it will only hurt us as a society. 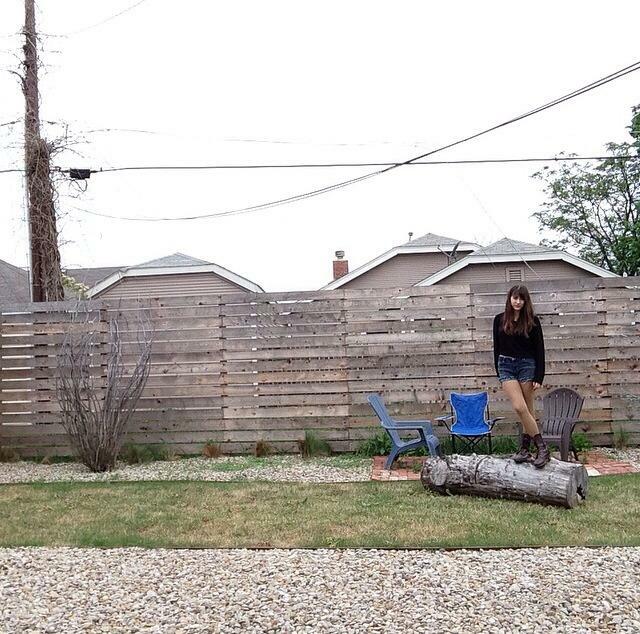 Here is a photo of me in our Airbnb backyard located in the historic neighborhood of Fairmount in Fort Worth. Today I wanted to talk about calories. When I was younger, I always thought “You get like 2,000 calories a day? That sounds like a ton, I could never surpass that, so I won’t think about that ever again”. And then I later wisened up and tried one of those calorie counter apps (actually SparkPeople.com which I found to be an incredible FREE resource) and began to learn a lot. It was surprisingly easy to go over 2,000 calories a day. And someone like me with a desk job actually requires quite a bit less. Although I see temporary calorie-counting as a beneficial way to learn more about the food you eat, there are a couple of flaws to the system. Most importantly, the apps are only able to accurately track items with barcodes, or popular menu items from fast food restaurants. It is nearly impossible to type in every item from the stir fry you just made (1/8 carrot, 1/8 zucchini….). Also, a calorie is not a calorie. Let’s compare 100 calories of Doritos to 100 calories of almonds. The Doritos enter your body and are not really given a second glance. They go straight on through to the “junk storage units”. Almonds, on the other hand, go through an intricate digestion process, which burns calories in the process, and gives nutrients to your body. And every body digests differently, so the “net calories” in a handful of almonds can vary from person to person. So, while calories are important to take into consideration, you should keep those “100 calorie snack packs” far away from your kitchen! When you eat real food, your body will naturally regulate your calorie consumption, so you won’t have to worry about it so much. Let’s face it: who eats 100 calories of Doritos? That is 8 chips. If you are still transitioning to real food, try this for an afternoon snack: eat 1 Dorito, and savour the flavour for an entire minute. Then eat a raw carrot. Or two! Same colour, but this snack will actually keep you satisifed until dinner is ready. When you eat cereal for breakfast, or doughnuts, bagels, anything that is made of refined sugars and starches, “particularly alone, without fats or protein, they enter the blood stream in a rush, causing a sudden increase in blood sugar” (Nourishing Traditions, p. 24). And don’t you notice, on days you eat cereal, you are hungry again well before lunch time? The problem with cereal is not only its sugar content and added chemicals, but the extrusion process is equally harmful. Many popular cereals are now boasting that they are “Whole Grain”, however “whole grains that have been processed by high heat and pressure to produce puffed wheat, oats, and rice are actually quite toxic and have caused rapid death in test animals” (Nourishing Traditions, p. 25). If you need a crunchy bowl of something doused in milk, please stay away from the cereal aisle! Even brands like Kashi®, Nature’s Path®, Cascadian Farm®, while they are better than Kelloggs® and General Mills®, are not the best. The best is always home made!!!! Always read the ingredient labels on your cereal/granola products (like everything else). If the list includes items that you yourself would use to create a homemade version, then by all means, you deserve a little convenience every once in a while! The best granolas usually come in plastic pouches and were crafted in small batches by people who care. These can be quite expensive though! 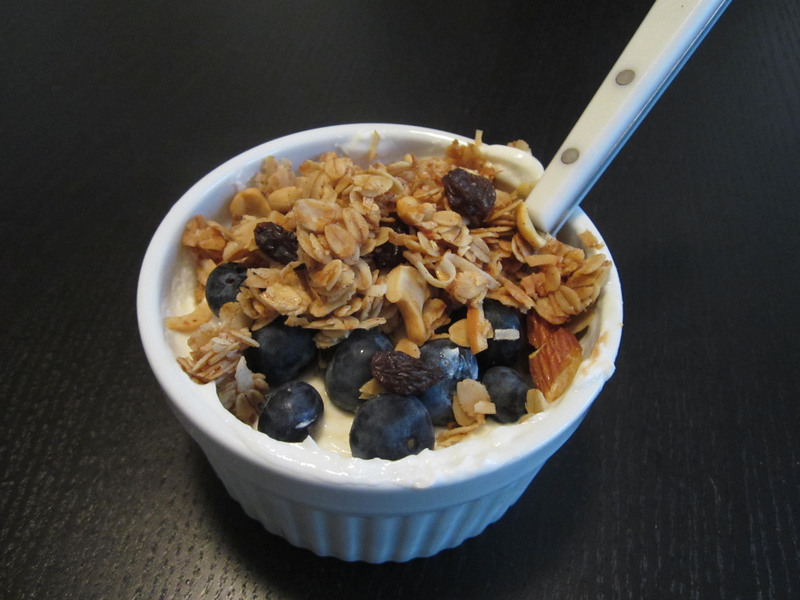 I suggest adding granola-making to your Sunday evening routine, and you will have cereal for the week, home-made. Combine all ingredients except raisins. Line a sheet tray with aluminum foil, and spread mixture out evenly. Place into a cool oven, turn the heat to 300°, and bake for 15 minutes. 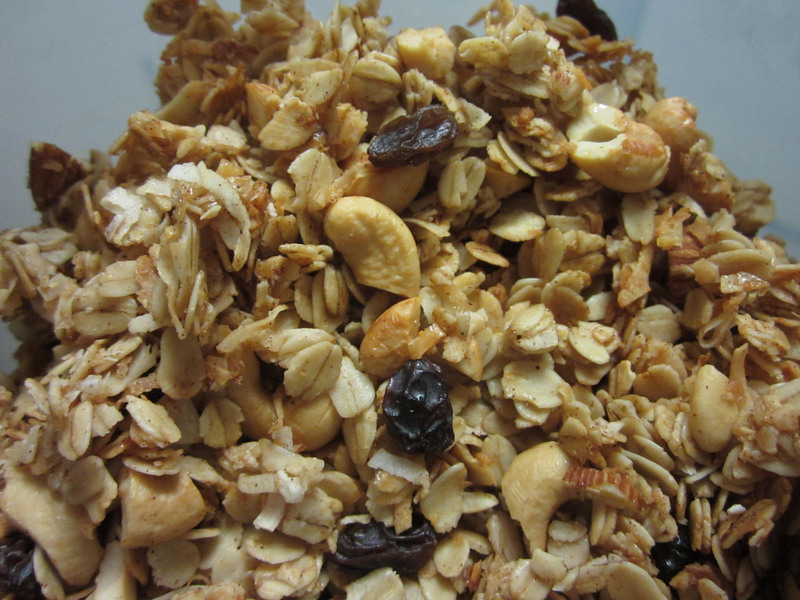 Take it out and give your granola a good shuffle, then bake for another 15 minutes. Let it cool completely, add raisins, and then transfer to an airtight container – store for 1 week. Look at that list of ingredients! Coconut oil/flakes, local raw honey, beautiful nuts and dried fruit, cinnamon, unprocessed oats. Those are ingredients I can get behind starting my day with. “When sugars and starches are eaten in their natural, unrefined form, as part of a meal containing fats and protein, they are digested slowly and enter the bloodstream at a moderate rate over a period of several hours” (Nourishing Traditions, p. 24). I thought to myself “Wow.” I have successfully transformed myself from someone who ate fast food nearly every day, to the kind of person with a reputation of not touching it with a ten foot pole. In the city where I grew up, there was a strip with a McDonalds, a Wendys and a Tim Hortons all next door to one another. During high school, my friends and I would regularly drive thru all three, choosing one item off each menu. My regular order was a McDonalds cheeseburger, Wendy’s chicken nuggets with sweet & sour sauce, and a chocolate chip muffin from Tim Hortons. Not only did a version of this occur almost daily, it was not a part of breakfast, lunch or dinner. 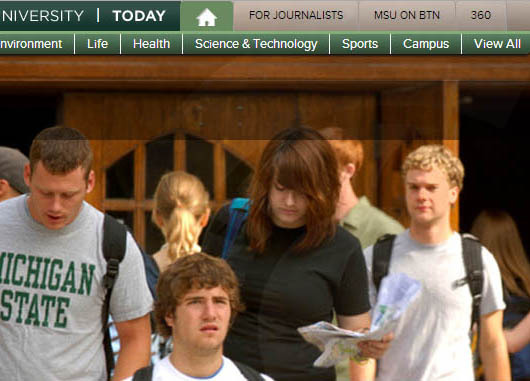 Here is a photo of me at the beginning of college. It’s crazy to think about, but that is just what kids do in high school, and nobody thinks anything of it! There isn’t really much else to do besides get into trouble, and I definitely wasn’t cool enough for that! So you, reader, are probably not going through 3 drive thrus a day. You may not even call yourself a fan of the concept of fast food. You may have even skimmed a couple internet lists of “The 12 Worst Chemicals You Never Knew You Were Eating”. But I can almost guarantee that you still eat fast food from time to time. Today is the day to swear it off once and for all. No amount of “convenience” is worth poisoning your body. Fast food has absolutely zero redeeming qualities. Nobody is morally “pro” fast food. Nobody. It is not going to be a very controversial decision. If you are stuck in a routine, however, it can be hard to change. Let’s say you and your favourite coworker enjoy Wendy’s every Wednesday, or you and the guys/gals routinely go out for Taco Bell after a night at the bar. Or on family road trips you stop at McDonalds for your beloved McFlurry and French Fries. It’s hard to break with traditions. You might feel embarrased to tell the coworker or friends that you are no longer eating fast food. But I’ll tell ya, it’s just the first few times that are awkward. Before long, everyone will know you as a person who would “never eat fast food!” and you will feel so great about that. The moral of the story is, you can change any characteristic that currently describes you. You can be an infinite number of versions of yourself. I bet your facebook friend, the avid runner, remembers the version of herself before she went for her first run (even if you couldn’t possibly picture her any other way). 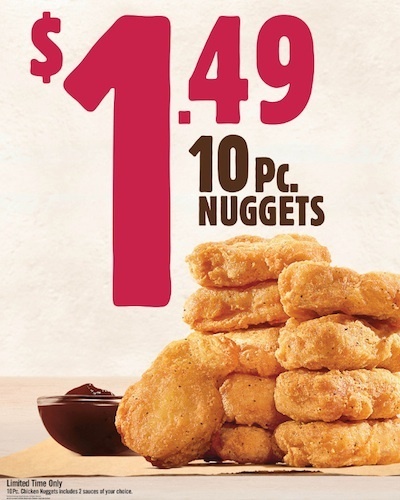 I am going to make my own chicken nuggets this week. I bread the chicken with falafel mix, and it is divine! Try it sometime. Love, Kayla. CHICKEN NUGGETS (Fried): Chicken Breast Pattie Fritters with Rib Meat Chicken Breast with Rib Meat, Water, Flavoring [Potassium Chloride, Flavoring, Autolyzed Yeast Extract, Maltodextrin (Corn, Potato), Salt, Chicken Fat, Contains less than 2% (Chicken Broth, Citric Acid, Dextrin, Disodium Inosinate & Disodium Guanylate, Dried Chicken, Mannitol, Modified Cornstarch)], Modified Food Starch, Salt, Sodium Phosphates. BATTERED WITH: Water, Wheat Flour, Modified Wheat Starch, Modified Corn Starch, Salt, Sodium Gluconate, Leavening (Sodium Bicarbonate, Sodium Aluminum Phosphate, Monocalcium Phosphate), Dextrose, Spices, Garlic Powder, Onion Powder, Extractives of Turmeric. PREDUSTED WITH: Wheat Flour, Modified Corn Starch, Wheat Gluten, Salt, Leavening (Sodium Aluminum Phosphate, Sodium Bicarbonate), Sodium Gluconate, Onion Powder, Garlic Powder, Potassium Chloride, Spice. Breading Set in Vegetable Oil. 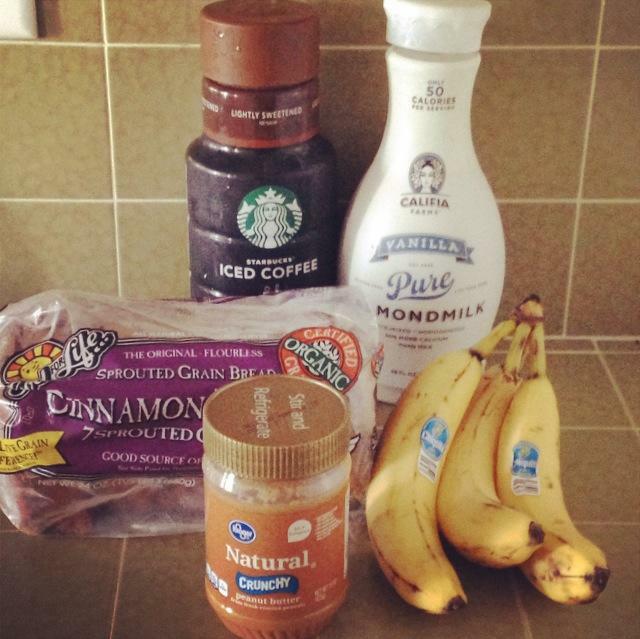 While on road trips or during traveling in general, it can be hard to find real food options. There are a lot of fast food and vending machine options, and not much available in terms of real food. In the airport, you can often find a variety of dried fruits and nuts in the book and magazine shops, and sometimes coffee shops will sell apples and bananas at their counters. When I take road trips, I always bring a homemade “trail mix” concoction with me, and you will find me munching on it while sitting at the table at Wendy’s with my fast-food approving comrades. Don’t worry about looking silly, you will actually look smart. Chicken Breast, Water, Seasoning (sea salt, maltodextrin, natural flavors, yeast extract, onion powder, garlic powder, sugar, gum Arabic, dextrose), Modified Corn Starch, Sodium Phosphates. Rubbed with Paprika and Spice. Iceberg Lettuce, Romaine Lettuce, Spring Mix (baby Lettuces [red & green romaine, red & green oak, red & green leaf, lolla rosa, tango], spinach, mizuna arugula, tatsoi, red chard, green chard), Fire Roasted Edamame, Cucumber, Red Bell Peppers. Cashews, Onion Garlic Seasoning (onion powder, garlic powder, salt), Canola Oil, Soy Lecithin, Sea Salt, Paprika, Cayenne Pepper. Water, Brown Sugar, Corn Syrup, Rice Vinegar, Chili Garlic Sauce (salted chili pepper [chili peppers, salt], garlic, sugar, rice vinegar, water, modified corn starch, acetic acid), Soybean Oil, Miso (water, organic soybeans, rice, salt, koji starter [aspergillus oryzae]), Lime Juice (water, lime juice concentrate, lime oil), Soy Sauce (water, soybeans, salt, alcohol), Cilantro, Ginger, Mustard Seed, Sea Salt, Garlic (dehydrated), Spice, Natural Flavor, Roasted Garlic, Guar Gum, Xanthan Gum, Extra Virgin Olive Oil, Red Pepper (dehydrated), Yeast Extract, Oleoresin Rosemary, Citric Acid. CONTAINS: SOY. That is far too many ingredients for me. Plus, I don’t like giving these companies my money. When I get where I’m going I will stock up on my essentials. Luckily in L.A. it was easy to find my favourite brands. There solves the breakfast problem. I always have to have my peanut butter banana toast within a half hour of waking up, or I get grumpy. “Going out to breakfast” always takes so long; by the time everyone is finally showered, dressed and ready to go, and then you wait for a table, it is lunch time anyway! Lunch and dinner are usually eaten out during vacation, and luckily in L.A. everything is free-range, grass-fed, and organic! 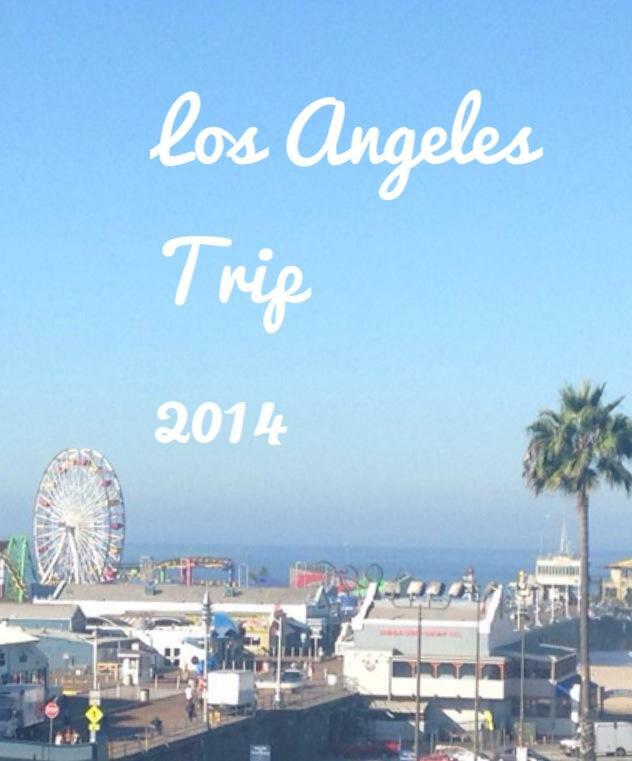 We had so much fun on our trip, I can’t wait to go back again someday. My favourite part was probably the availability of real food. Here in Michigan, the term is hardly, if ever, used. I don’t even have any real foodist friends, do I?….. 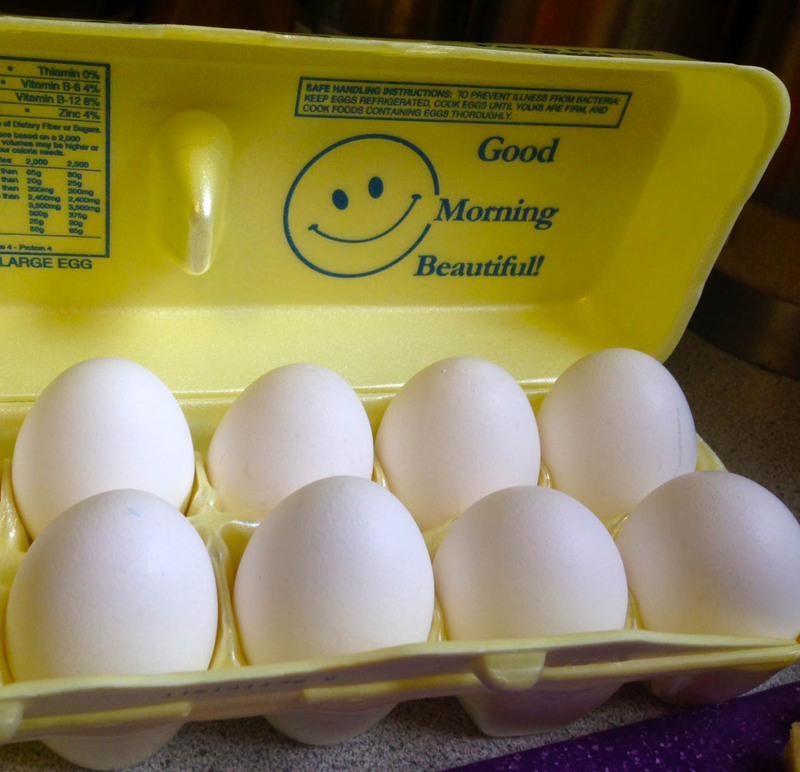 These are all slogans you see on different varieties of egg packaging at the grocery store. But what do they really mean? First of all, brown eggs are no more “natural” than white eggs. Different breeds of chickens lay different coloured eggs, and that is that. “Grain Fed” and “Vegetarian Diet” are both problematic. Chickens are not vegetarians. Ones that are free to roam in the pasture eat insects, which are vital to their, and our, nutritional needs. What can be considered “Free-Range” by technical standards is not what you picture in your head when you hear the term. “Natural” is a big labeling problem – I’m not sure there are ANY regulations on this one. As far as the Omega-3 enriched eggs, these are basically conventionally raised chickens except their feed is supplemented with an omega-3 source like flax. What I’ve found is there is no right answer. I’m not sure any of these options are any better or worse than any other. In my local Kroger, for example, they have eggs that range from 0.99 cents to 5.49 a dozen – all with varying packaging materials and marketing slogans. The dollar eggs have simple styrafoam packaging, and the expensive eggs have cardboard packaging with nice fonts and green coloured logos. Each appeals to a different demographic, but they could very well be the very same eggs inside. Here is a chart that outlines some nutritional differences between conventional eggs and true free-range eggs. The only way to know for sure that the eggs you are feeding to yourself and your family are chock full of nutrition is to purchase them from a local farm. John Henry’s sets up at the Royal Oak farmers market on Saturday mornings, Birmingham farmers market on Sunday mornings, and does bi-weekly delivery to many cities in Michigan.